Yeah – the waiting stinks. We’re all set. The boys are bored. They think this is overkill. I just kept telling them – Plan for the worst; Hope for the best. Stay safe! That’s one of the things about hurricanes… they take so loooong. Not like a thunderstorm, bang, crash, it’s over. I never knew New Yorkers were so compliant… pink tape keeps them out? Yes. I drove up to the Catskills yesterday afternoon and it seems like I’ve been up here for a week already. 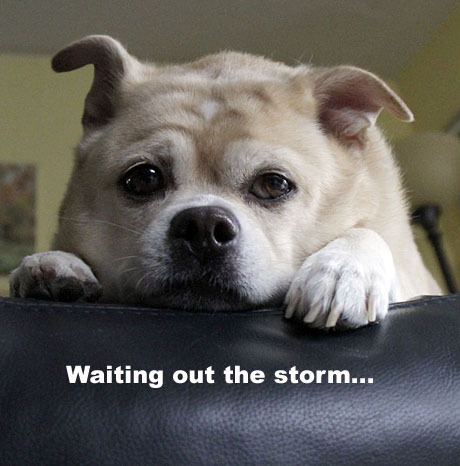 I’ve stopped watching the continuous storm news coverage — I think that’s contributing to the slow moving time. Fortunately I just discovered that BBC America has a Doctor Who marathon. Time to settle in with some weird plot lines and wait out the storm in the Catskills. Hi Bumper Sticker Ruth – I wish you the happiest of birthdays where ever you safely land. Judalaaaaaaaaaaaaaaaaaa, the pink plastic tape has always been a favorite of mine. I hate it when there’s “track work” and from a block away you can see that tape and know the subway is closed. As is the whole city this weekend. Is this crazy or what? I’m glad I read the comments. Thanks Bumper Sticker Ruth, I’ve always wanted to catch Doctor Who and now I can watch some episodes whilst I wait for Irene’s arrival.